As recording technology continues to become more affordable, gaining access to high-quality condenser microphones is easier than ever. Brands like Neumann, Audio-Technica, AKG, and MXL are releasing quality mics at prices we couldn’t have imagined ten years ago. The problem is picking the best condenser mic for you. With all of these options, how do you find the microphone that best suits your voice, instruments, and room? The answer won’t always be easy – even the nicest, most expensive microphones can’t be the perfect microphone for everybody. The best way to pick your newest microphone is to hold it in your hands, put it on a stand, and test it out. Even still, with all the great options available today, trying every microphone could take a lifetime. That’s why we put together a list of some of the top condenser mics on the market today. What is a Condenser Microphone and How Do You Use One? What Does a Condenser Microphone Need? Condenser mics have become the go-to microphones for recording studios and many live performance applications. They’re more durable than ribbon microphones and typically have a more accurate tone than dynamic microphones. Loosely speaking, the sound is created by an electrically charged plate next to a solid backplate (capacitor) placed inside the microphone capsule. When sound enters the microphone, the diaphragm moves and the backplate stays still. The changing distance between the two plates creates an electrical signal which is a recreation of the original sound source. Condenser microphones can be a little needier than ribbons or dynamic microphones. Unlike other mics, a condenser mic’s signal isn’t strong enough to function without a little extra help. You’ll need to make sure that you have something in your sound set up that can provide you with phantom power. The good news is that most soundboards, audio interfaces, and microphone preamps offer phantom power. If needed, you can even buy phantom power supplies as a standalone unit. All of the microphones on this list are XLR condenser microphones. To use them, you will need to make sure that you have an XLR Cable. Guitar or speaker cables won’t work. Before you buy, factor in that you may want to consider investing in a nicer shock mount. A shock mount is a piece of equipment that connects the microphone to the stand. They help to ensure that the microphone is suspended and is as isolated as possible. This way, you don’t pick up the sound of feet tapping as the musician tries to keep their rhythm. Most microphones will include one with the microphone but they come in various levels of quality. An good aftermarket shock mount can help eliminate outside noise and clean up your recordings. Before anything, figure out what your musical needs are. Some microphones excel at recording acoustic instruments. Other microphones will excel at capturing vocals. Other mics may be great “all-arounders” but don’t specialize in any one thing. It won’t make much sense to buy an “all-arounder” if you only ever play instrumental music. Are you playing live or recording? Some microphones are more durable than others but may not offer the same tonal precision. What other features does the microphone have? Some of the high end mics offer variable polar patterns, bass roll-offs, or pad switches. These are all great options that can make you feel like you got three mics for the price of one. Finally, what extra goodies are you getting? Some microphones feature a higher quality shock mount than others. A few even come with a bag or carrying case. Typically, a condenser microphone will have an omni-directional or a cardioid pattern. This means that they are more sensitive and pick up much more of what’s going on around them. This can work great in the right context. In fact, many traditional bluegrass bands will use a single condenser microphone to mic the entire band with great results. Unfortunately, condenser mics can also cause some problems when used in the wrong context, and they tend to work best in controlled environments. If you are playing live, they work well on a relatively quiet stage. You’ll want to make sure that the musicians either have in-ear monitors or that the floor monitors and amps aren’t behind the microphone where it will pick up the sound and create feedback. If you’re playing a loud bar gig, you’ll probably want to lean toward a different type of microphone. On the other hand, if you’re playing in a music hall or a low-key coffee shop gig, the accuracy and responsiveness of a condenser microphone can give you some incredible results. Condensers have been used for just about everything when it comes to recording. Their wide polar patterns and quick response make these microphones ideal for a studio setting. Some of microphones even have variable polar patterns to offer more tonal options. Make sure that your sound source has some room to develop. You should experiment with your ideal microphone placement, but you’ll typically want to put the microphone between six and twelve inches from whatever you’re recording. If you are going to record multiple people at the same time, remember that a condenser is likely going to be sensitive enough to pick up everybody playing. Sometimes this can work well but it can also cause problems later if you need to do any editing. If this is the case, you may want to make sure that each player’s sound is well isolated or that you record each person individually. Typically, condenser microphones have a small boost between the 8 to 12kHz frequencies. You’ll want to watch out for these spots and EQ accordingly. 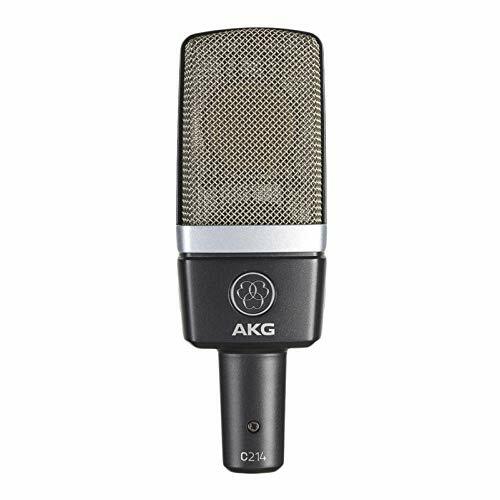 The AKG C214 is a great microphone that gives you incredible bang for your buck. Based on the awesome C414, the C214 uses the same capsule as its older brother. This capsule is suspended within the microphone, which is like having a built-in shock mount. The tone is crisp and clear with just a little coloration, which pairs well with male vocals. It looks, feels, and performs like a professional condenser microphone. The major difference is that the 214 is a fixed cardioid polar pattern whereas the 414 has variable polar patterns. This microphone is made in Austria and is incredibly well-built. Its durability makes it perfect for live and on the road use. Most often, this microphone can be seen on guitar cabs and vocals. High SPL’s aren’t a problem for this microphone. It features a -20 DB pad switch, and it also has a bass roll off switch to help eliminate any low hum noises in the background when you’re recording. 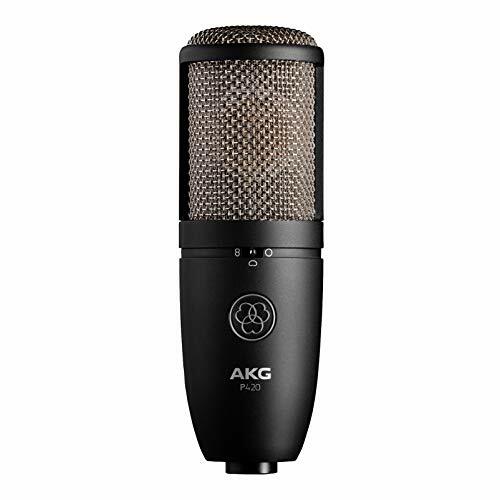 The AKG comes with a nice aluminum case and a so-so plastic shock mount. This microphone is built for abuse, but we recommend upgrading to a better shock mount if you’re rough on your gear. But overall, this microphone will give you professional-quality tone without breaking the bank. Neumann microphones are the Rolls Royce of condenser microphones. You can find them in nearly every high-end recording studio, and they have been used in many of the most iconic recordings ever made. 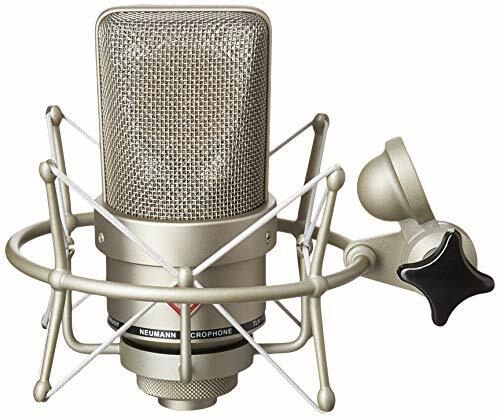 The Neumann TML 103 microphone has the highest price point on the list and rightly so, since it is based on Neumann’s flagship mic, the U87. Unlike the U87, this microphone doesn’t feature a variable polar pattern. Instead, it comes as a permanent cardioid pattern. The TLM 103 is a professional condenser mic that produces an incredibly accurate sound with little to no color added. Every microphone will have some level of self-noise (noise that the microphone creates itself), but there is virtually none of that with this mic. Because of its accuracy and tone, this mic shines on almost every application from acoustic guitar to vocals. It looks good, with a smaller, more modern-looking capsule than some of Neumann’s more standard line. If you get the deluxe set, this mic comes with a nice aluminum carrying case and a well-made shock mount. The standard Neumann TLM 103 set is a bit less expensive, but you’ll want to upgrade the shock mount at some point. The Neumann TLM 103 is easily the priciest mic we recommend here – you can buy every other mic on this list for the cost of just one of these – but you won’t be disappointed when you hear what this microphone has to offer. The Audio-Technica AT2035 pops up in nearly every condenser microphone review and comparison largely because it’s the mic that every home studio should have. The quality and value of this microphone have made it a staple for budget recording applications. The AT2035 features a -10 DB pad and a bass roll off switch. It comes with a carrying pouch and a shock mount. The shock mount is similar to many other universal style shock mounts, which is a nice feature because you can use it on another microphone with similar sizing. Like the AKG C214, the shock mount is plastic and may not be best suited for road use. In all honesty though, I don’t think Audio Technica had that in mind when designing this piece. The microphone really is a great all-arounder and wants to be in a studio. This microphone is versatile, and does well in a wide variety of situations. On both male and female vocals, it adds just a little bit of warmth without changing the character of the voice. Even on acoustic instruments it stands out. This microphone stays incredibly even across the entire tonal spectrum and does a good job of smoothing out the higher frequencies. Audio Technica has perfected the art of back-electret technology, which allows them to create wonderful sounding microphones for much less money than the traditional condenser technology. The AKG P420 is the most versatile microphone to make our list, featuring the ability to switch between three polar patterns. Like the others, it can be set to cardioid but it can also be switched to omnidirectional or figure eight patterns as well. Some of the other features include a -20DB pad and bass roll off switch. Tonally, this is a brighter microphone than some of the others on the list. In all three polar patterns, there is a little boost around 20k. It’s least noticeable in the omnidirectional pattern. The boost doesn’t give the microphone a bad tone by any means, but it does give it a unique character. Paired with the right sound source, this microphone could be perfect. I would recommend this mic to anybody that finds their voice too warm or their instruments too muddy. The AKG P240 is well-built and excels as a microphone for live gigs. Its high sensitivity would make it ideal for capturing multiple sources at once. In the studio, it also works well as a room mic. I wouldn’t recommend this microphone for higher-frequency instruments like mandolin, violin, etc. This mic works best for larger, warmer instruments. The P420 will help develop separation to anybody that needs it. It also comes with an aluminum case and shock mount. This is perhaps the perfect budget microphone. 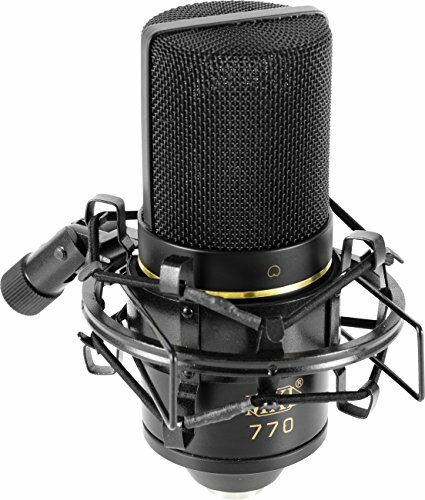 It’s hard to believe that you can buy a good-sounding condenser microphone for as low of a price as the MXL 770. But don’t let its price fool you. This microphone can easily go toe-to-toe with much more expensive mics. The MXL 770 performs very well in a variety of applications. It features a -10 db pad bass roll off switch. It has some accents on the bass as well as the treble. It does noticeably well on female voices that sound shrill through other microphones, as well as deep male voices that could use some more separation. This microphone also does well on brighter instruments like mandolin, banjo, or violin. The MXL 770 can be a little sensitive, and you’ll want to use it in a quieter setting. If you’re recording at home, make sure you’re in a well-treated room and beware of refrigerator/air conditioning hum. This mic also feels durable with a good build quality, and does very well on the road. For extra protection, it comes with a plastic carrying case that is surprisingly sturdy. It also includes a shock mount. Honestly, the shock mount isn’t the best, but it’s tough to complain for a microphone at this price point. If you like using condensers for live performances, the overall performance and affordability of the MXL 770 make it a great choice. 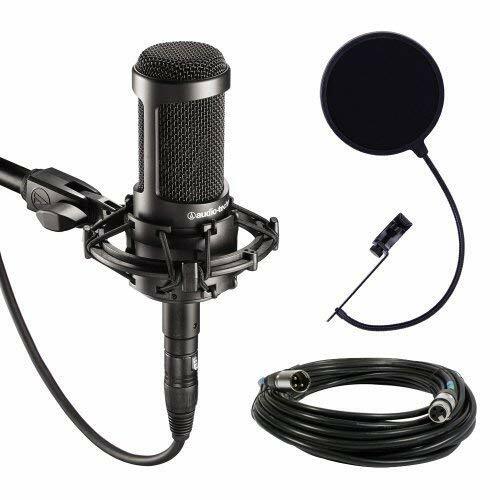 There are certainly better-sounding condenser that have more noise control, but this mic will give you excellent sound without having to worry about it getting lost or damaged. No matter how much money you have to spend, you can find a high-quality, great-sounding condenser microphone that do what you need it to do. Nearly every microphone brand is working to appeal to the average user by offering professional-sounding mics at entry level prices. It’s easy to get overwhelmed with all of the microphones on the market right now, but each of the mics on this list stand out from the rest. We hope the condenser mic reviews here will help you choose the best mic for your needs. Remember, no single microphone will ever be perfect for all applications. The microphone you use for your voice may not be the perfect mic for your instrument or your friend’s voice. Take some time to understand your music and your sound and find the microphone that is going to be the best condenser microphone for your needs. Use that microphone to build a foundation in your recordings. After finding the microphone that suits you, work on investing in microphones to fill in the gaps.